Welcome to Medina and Sons, providing landscaping services in Highwood, IL. In business for over 30 years, Medina and Sons landscape company is a 2nd generation full service landscape design/build, installation and property maintenance firm located in Highland Park, IL and serving Lake Forest, Highland Park, Deerfield, Glencoe, Winnetka, Northbrook and surrounding areas of the North Shore. We care for our customer’s property with pride, attention to detail and provide the highest level of customer service, dedicated to our customers’ needs. Every property is unique in its own way, so we at Medina and Sons, focus on understanding the needs and objectives of each customer’s landscape and provide timely delivery of service. 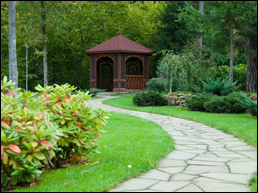 Medina and Sons Landscape Company is a member of the ILCA-Illinois Landscape Contractors Association, PLANET- Professional Land Care Network. We are also members of the Highland Park Chamber of Commerce and Highwood Chamber of Commerce. Is developing a long lasting relationship with our clients and making their landscaping investment beautiful by designing a program tailored to meet the needs of the landscape and provide timely delivery service. Our continued relationship with our clients is our number one asset. For more information on the services that we offer, contact us today and learn how we can put our expertise to work for you and your property! Copyright © Medina and Sons, 2012. All rights reserved.